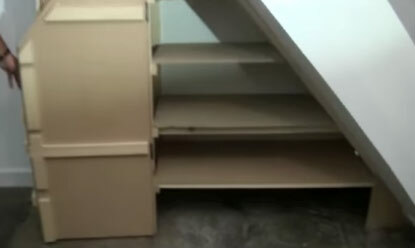 Learn how to make this fantastic under stair cupboard yourself. Follow these simple instructions to make a space saving cupboard under your stairs and create valuable under stair storage for your home that could include storage items such as a shoe rack or shelving unit. We explain the process and techniques so that you can make the cupboard by following our design or modifying it to suit the space and type of stairs you have in your home. 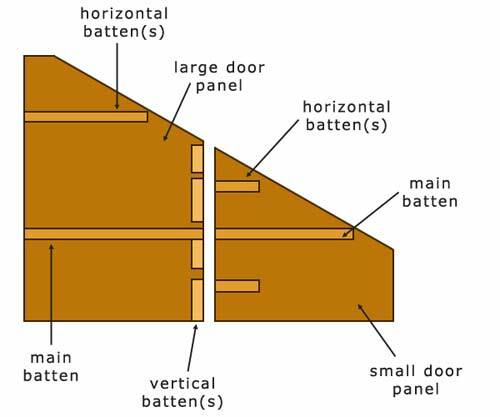 Download the plans and materials list so you can build this under stair cupboard yourself. This cupboard has been designed with a number of features that allow you to fully access all parts of the cupboard from both the end and the side so that there are no dark corners that you can never get to. The doors to your under stairs storage are designed to open and fold back on themselves, wrapping around the cupboard so that when they are open they are not in the way. Please have a look at the video (at the bottom of the page) for more details. The design is a flexible one so that you can alter dimensions to suit your under stair space or you can follow these instructions and you will have made a clever storage space under your stairs in around 5 hours, and cost less than £100. In these instructions we will not include dimensions and measurements as this will depend on the angle of your stairs and the size of the under stair cupboard that you have decided to make. Fix your outer (main) upright for the other corner of the cupboard from floor to ceiling. You will need to use a sliding bevel to cut the top of the upright at the correct angle so that it meets the stairs. Paint your cupboard. Remove the furniture – hooks and handles – and then paint the cupboard in the colour required. Learn more about the art of painting MDF successfully on the MDF painting project. Once you have completed painting and it has dried you can reattach the hooks and handles and you are finished! The cost will be about £80.00 and you will need to plan for around 5 hours in labour to get the cupboard built. 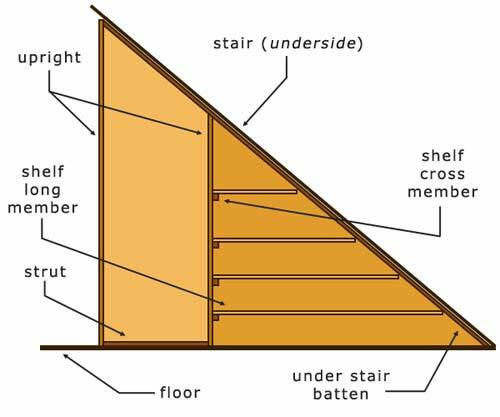 Building an under stair cupboard is a very satisfying project for any DIY enthusiast. It is not too difficult and in a relatively short time you will have a cupboard that you can really be proud of. The more advanced carpenter will be able to see how they can take our basic design an modify it to suit their needs and tastes, however if you like our design we are preparing detailed cupboard designs that we will be able to email to you so you can see in even more detail how we managed to make this under stair cupboard and how you can follow the same instructions – like IKEA, but much more satisfying!